Surfers gather for the pule or blessing during the opening ceremony of the Hawaiian Pro at Haleiwa, Oahu, Hawaii, USA. 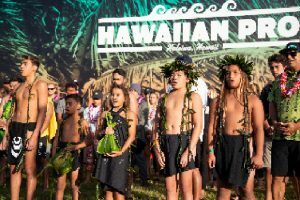 (Monday, November 12, 2018) – The 36th Annual Vans Triple Crown of Surfing fired into action on opening day of the holding window, as Round 1 of the Hawaiian Pro saw North Shore standouts like Kiron Jabour (HAW), Finn McGill (HAW) and Mason Ho (HAW) claim their stake in Round 2 alongside international Qualifying Series (QS) hopefuls Victor Bernardo (BRA), Noe Mar McGonagle (CRI) and Adin Masencamp (ZAF). 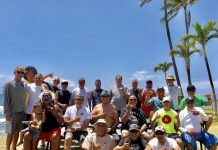 The Hawaiian Pro is a World Surf League (WSL) Men’s QS 10,000 event and will count toward 2019 Championship Tour (CT) qualification, plus an early lead on the Vans Triple Crown of Surfing (VTCS) Champion title. Brazil’s Victor Bernardo posted the day’s highest single wave score, an 8.33 for excellent power surfing in Round One Heat 9. Bernardo attacked his final wave of the heat with a solid snap off the top and then flowed into a big, wrapping turn and completed the ride with a committed closing maneuver. He and fellow advancing competitor David Van Zyl (ZAF) eliminated two local athletes – Noah Hill (HAW) and Sheldon Paishon (HAW) – on their hunt for points and prestige. Freshly crowned 2018 WSL Hawaii/Tahiti Nui Regional QS Winner, O’Neill Massin (PYF), moved onto the next round after advancing behind Jack Robinson (AUS) in an internationally mixed, competitive heat. Robinson was able to secure two mid-range scores – a 5.17 and 6.33 – while Massin earned second after scoring a 6.07 on his final ride. Massin won the regional QS circuit at the HIC Pro after a runner-up finish to Jabour, which was his goal for 2018, and now looks forward to enjoying his time competing in the VTCS. Many athletes took to the air in the ramp-like waves today, but the flying standout was Tahiti’s Mihimana Braye (PYF) who earned a 7.00 on a tail-high air reverse – his highest and cleanest aerial maneuver of Heat 4. “I’ve been training at my home break of Papara and the left is kind of similar to this,” said Braye. “I’m feeling confident, I have some good boards, my DHD works good. I’m feeling good and can’t wait for the next one.” Braye went against a stacked heat that included Hawaiian phenom Mason Ho (HAW), Maui’s upstart Cody Young (HAW) and Gatien Delahaye (FRA). Surfline, the official forecast partner of the Vans Triple Crown of Surfing, is predicting a mix of old/fading shorter period NNW swell and new/building longer period NNW swell peaking Tuesday night. The remainder of the week has plenty of solid surf on offer and contest organizers will reconvene tomorrow morning to make a call by 7:00 a.m. HST. Each event of the 2018 Vans Triple Crown of Surfing will run on the four best days of surf within the event’s holding window. LIVE streaming is available on WorldSurfLeague.com, VansTripleCrownOfSurfing.com, Facebook.com/wsllive and the WSL and Facebook apps (Facebook login required for mobile viewing). Or tune into Spectrum SURF Channel, which will televise the action LIVE and in replay on digital channels 20 and 1020HD, across the state of Hawaii.